Country music has a timeless appeal. No matter how much technology improves the production process, there will always be room for a songwriter with a simple story to tell and an acoustic guitar to tell it. Now, that’s not to say all modern country music sounds like that. Take a look at what the hottest songwriters in the country are releasing. This self-proclaimed good ol’ boy from Mississippi is also a nominee for this year’s rising singer/songwriter award by the Association of Independent Music Publishers. Coming hot off his latest self-titled EP, Rodgers is making a name for himself as more than just an Eric Church-inspired writer. He’s set to hit the road as the opening act for Luke Combs in 2019. A location such as Alberta, Canada may not conjure up the Old West imagery of a typical country star, but that’s not the case with Townes. As a potent storyteller, her emotional lyrics pull no punches. Townes is currently finishing up a tour with Miranda Lambert and Little Big Town. Personally endorsed by Garth Brooks himself, King really is “what country music is all about.” The west Texas-born songwriter follows in the footsteps of his heroes (Brooks among them), writing traditionalist country tunes in the vein of the now-classic ’90s era. Listen to any of the tracks off his latest self-titled album and see if you don’t get any of that feel-good country nostalgia. There’s no doubt that Underwood’s worldwide claim to fame is due to her winning the fourth season of American Idol. But while the reality show may have put her talent on the map, her skills as a songwriter prove that she has real staying power. Her sixth album, Cry Pretty, which released in September 2018, marked her debut as a producer in addition to her song writing and performing duties. Even more impressively, after the album’s release, Underwood is the only woman in history to have four country albums hit the Billboard 200! As the son of country music composer and songwriter Rhett Akins, it’s no surprise that Thomas Rhett would go on to write modern country hits like “Life Changes”, “Marry Me”, and “Die a Happy Man.” Rhett’s work has consistently hit top country music charts, as have the songs he’s co-written with other noteworthy stars like Jason Aldean. From an early age, Luke Laird was a lover of music – and more importantly, recording and production. The combination of these interests led him to acquire a degree in Recording Industry Management, and eventually a publishing deal with BMG Music. Laird would lend his songwriting talents to artists such as Lee Ann Womack, Carrie Underwood, Blake Shelton, Tim McGraw, Eric Church, and many others. Since 2000, McKenna has penned some of the biggest hits in country music. She’s written songs for Tim McGraw, Faith Hill, Sara Evans, Reba McEntire, Keith Urban, Little Big Town, and Carrie Underwood. She’s a powerhouse of the Nashville writing scene and the winner of numerous industry awards and accolades. No question about it: listeners love gobbling up the poppy, danceable brand of country music put out by this five-piece band from Nashville. In the last two years, they have been nominated for a slew of awards and have even won the Vocal Group of the Year award at this year’s Academy of Country Music Awards. 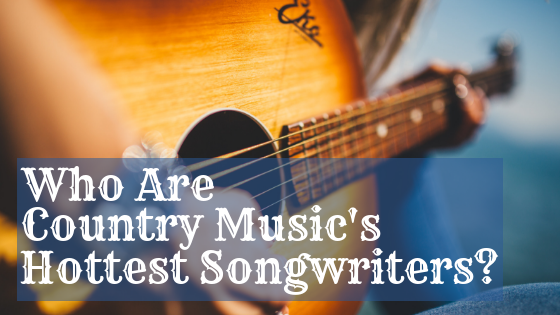 Country music songwriters capture the emotions of the human experience. Whether it’s love or pain, it’s what makes it the beauty of country music. Who’s your favorite country music songwriter? Leave us your comments.